While usually moles are mostly harmless and don’t require treatment, sometimes a mole may need to be removed if it poses a risk for skin cancer or for beauty reasons. Cosmotree Clinic offers some effective options for mole removal in Delhi, Gurgaon, and Mumbai, once our doctors has identified a dangerous mole or you have a mole you want to remove. 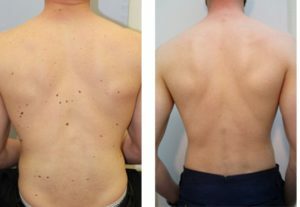 Cosmotree Clinic offers best mole removal treatment in Delhi/Gurgaon, and Mumbai. • Moles are a nevocellular skin occurrence in the skin’s various layers. • Usually are dark brown spots and can be of various sizes and shapes. • They can appear flat or raised, smooth or rough. • Moles can appear anywhere on the skin. • They are usually brown in color Sun exposure may darken existing moles and increase their number. producing cells (melanocytes) in both the upper and lower layers of the skin (epidermis and dermis). • Dermal moles: Range from flesh-color to brown, are elevated, most common on the upper body, and may have hairs. Cosmotree Clinic offers best some mole removal treatment in Delhi. • The area to be treated is made numb, which is cut out along with a small area of the surrounding skin. • Some moles may have cells that have grown beneath the top layer of skin. • Use scar care treatment for few weeks, as needed. • Keep the treated area dry. • No rigorous working out. • After the first three weeks, use sunscreen daily. • Fghty you fights yin. • Some skin mole can be shaved down with a scalpel. • The area to be treated gets numbed, and usually, only a small pink mark is left after the removal. • The area will be covered following the procedure. • Keep the area dry for 24 hours. • Apply Vaseline to keep the area moist for a few days. • This type of skin moles treatment may leave a small scar. • Laser Mole Treatment uses intense light radiation to break down the mole cells in the skin. • This method usually takes two or three treatments to eradicate the mole. • Do not pick at your spot, let it fall off naturally. • Avoid using harsh skin care products. • No heated workout for 24 hours. • Recovery time depends on the individual. • Young people recover faster than older people. • A larger incision will take longer to heal than a closer one. • Few weeks to heal. • Don’t touch or irritate the scar. • Keep the wound clean and moist. • Provides affordable mole removal treatments with great results. • Most top trusted brand in Delhi/Gurgaon and Mumbai for your aesthetic needs. At Cosmotree Clinic, you’re in good hands. Our specialists will provide you with the best mole removal treatments to meet your cosmetic goals, and we’ll do our best to keep you comfortable every step of the way. Give us a call at 9999909292 to schedule a consultation today. • It is recommended to opt for packages instead of single services for good. • You can go for consultation in cosmotree.